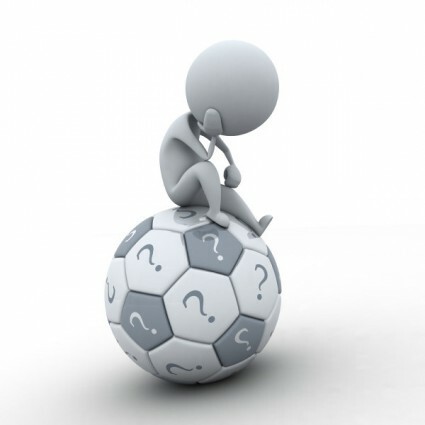 Can you believe 2014 is just around the corner? It only seems like yesterday that I was talking about 2013 being a brand new year! I'm determined to start the new year with an amazing new project in mind ... and I think I've found a contender! This past week I worked a couple of days in the store at Hettie's Patch, and one of the sweet ladies that came in purchased a book that I hadn't seen before. Before I left the shop for the day, I knew I had to purchase a copy for myself! 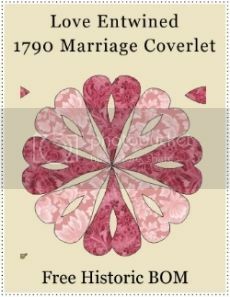 It's called 'Antique Wedding Sampler Revisited'. Ohhh my word, I am in lust! I can definitely see this project in my future. Also in my future, a good deal of scouting around looking for the perfect fabrics for broderie perse. Fabric shopping ... I CAN DO IT!! 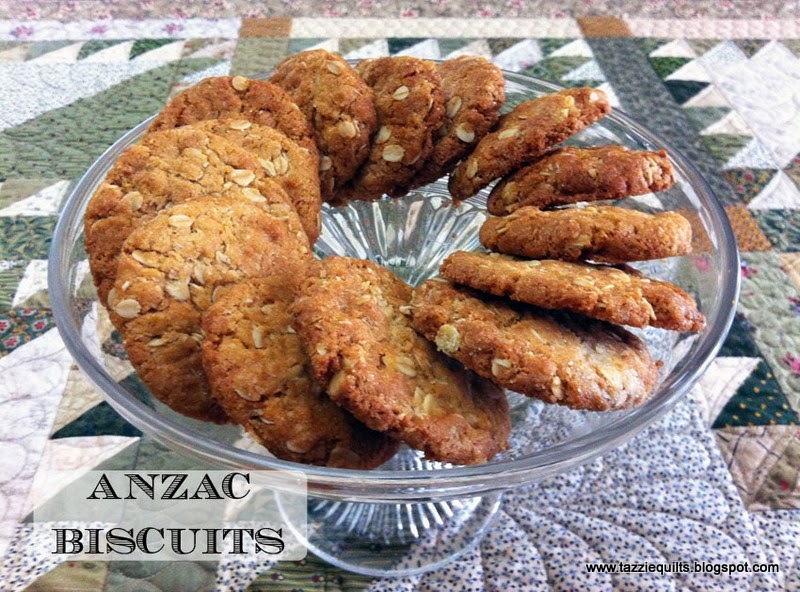 On a completely different note, I had a message from Nan V. asking a question regarding the Anzac Biscuit recipe I posted a little while back. I wasn't able to respond directly as Nan's profile is set to no reply, but I didn't want to leave her question unanswered. Her question was whether I used sweetened or unsweetened coconut in the biscuits. I have used unsweetened coconut - I don't imagine it would be a problem to use sweetened, but if you do, definitely reduce the amount of sugar in the recipe, as they're quite sweet already. Hope this helps Nan - thank you for your message. This has been a busy week, I do love the festive season - the shopping, decorating and socialising really are all such fun. 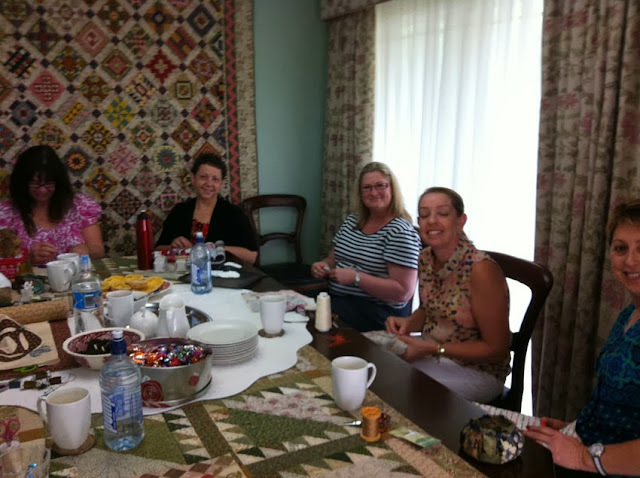 Here we have Kay, Claire, Loz, Shay and Val. Too many lovely ladies to fit in one picture, so here we have Shay, Val, Tess, Lorraine and Denise. 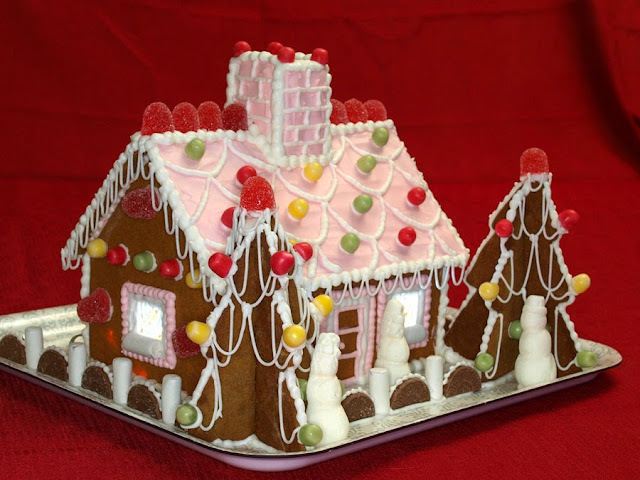 I always have fun playing with gingerbread - for this one we were limited to use Ikea's gingerbread house and pick and mix lollies. For fun I lit it up from inside and made trees for the yard. Lucky me, I got a call on Friday to let me know I was one of three gift hamper winners, Yay!! 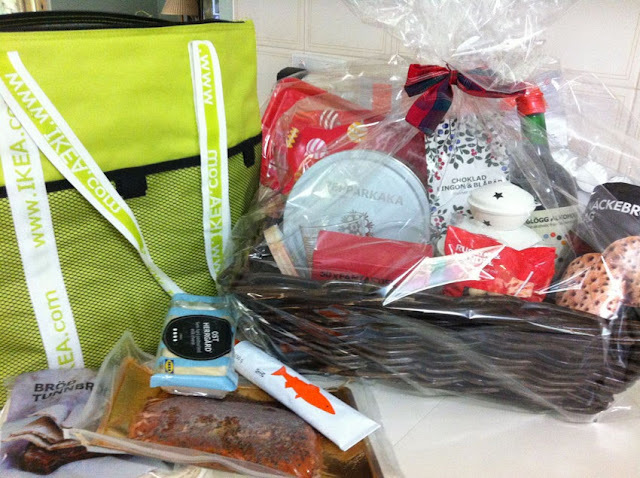 The hamper is amazing, so much fun stuff. We're going to have fun cracking into it tomorrow. Yesterday my lovely hubby did something for me that I have wanted for the longest time. He installed a new kichen sink for me. Ohhh happy days! From this distance it doesn't look too terrible, but let me fill you in ... the corotone sink was almost twenty years old, and had all sorts of scratches and gouges in it - especially in the bowls. The scratched areas get terribly stained, and it didn't seem to matter what I did - I just couldn't get it clean enough to make me happy. 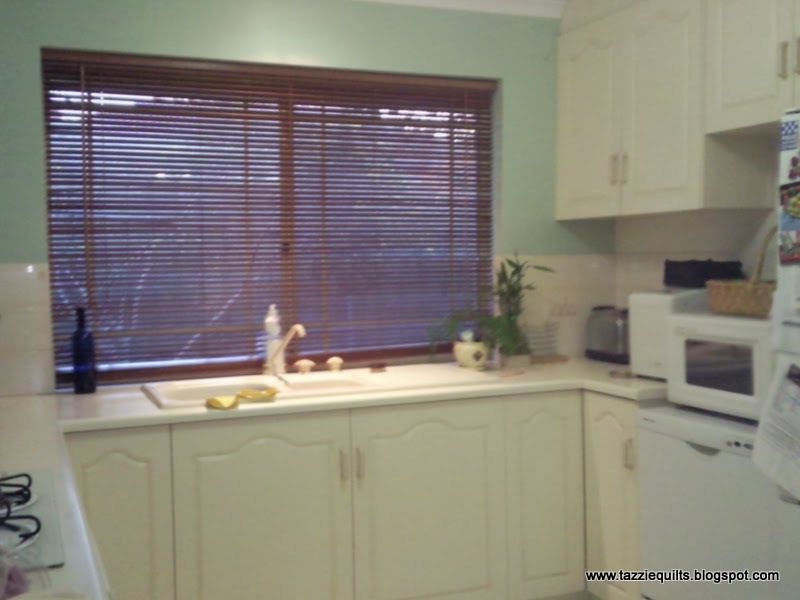 And I can't even tell you how frustrating it was not to have a drainer on the left side of the sink. Last on my list of grievances was the tiny second sink bowl. It was way too small to be useful in any way. Interestingly, it all bothered Marty way more than me, so a few weeks ago, he asked me to begin looking for the new sink. I knew what I wanted - our last home had a double bowl, double drainer stainless steel sink, and I made it my mission to find one. They're not as common as I thought, and really pricey - but I got one delivered last week, and yesterday was the day for installation. It took Marty most of the day - and I'm so appreciative. I made myself scarce while he was cutting a bigger hole in the bench - so nervous - but he's a magician, and it all worked out really well. Voila, here it is, complete with new tapware. 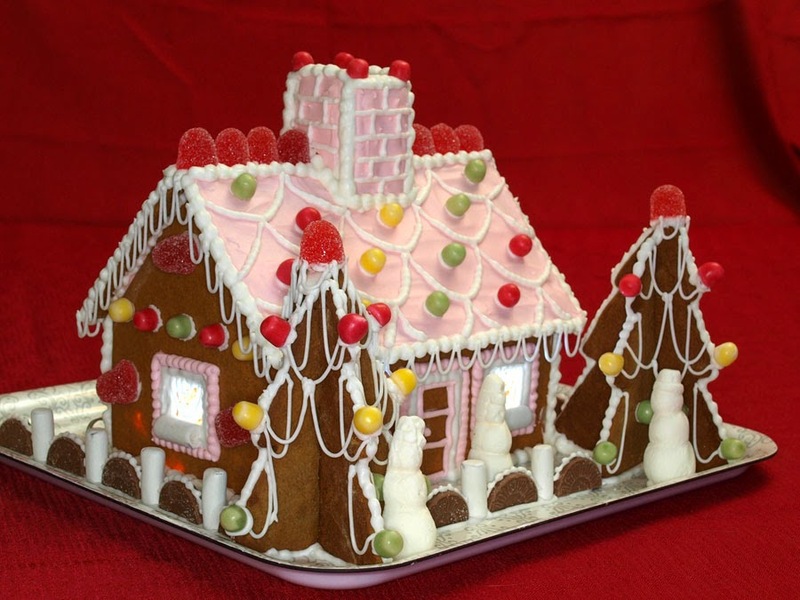 And today has me working in the kitchen, this time playing with gingerbread. I'm putting an Ikea gingerbread creation together, right now I'm waiting for icing to dry. 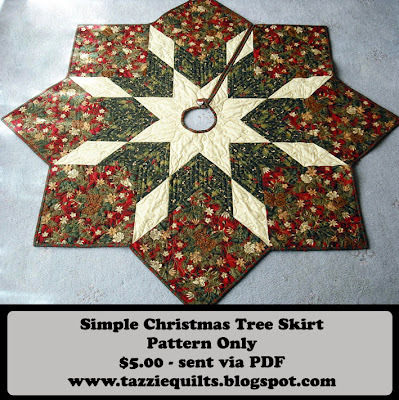 A HUGE thank you to all the lovely people who have ordered my Simple Tree Skirt Pattern over the past couple of weeks. There have been so many orders I've been really thrilled (and a little overwhelmed). Because I'm not super tech-savvy, when an order is placed on my website, I manually send the pdf out to my customers, which is great, but not super if someone wants to get sewing immediately. I just learned that Etsy have an auto download for patterns now, so I've put my pattern over there for those of you looking to do a little power-sewing in the lead up to Christmas. You'll find the link over in my side-bar. Finally I remembered to take a nicer picture of the Anzac Biscuits that I've been making lately. They are my hubby's very favourite thing, and he loves it that I try to keep some on hand at all times. This is a very traditional recipe, given to me by my sweet friend Norma. Mix together the above ingredients in a large mixing bowl. Mix the two above ingredients together in a small bowl, and then add to the melted butter mix. It will foam up nicely. Add the melted butter mix to the dry ingredients and combine well. Roll into small balls and bake for 12-15 minutes. I place 12 per tray, and leave room between the biscuits for spreading. This recipe makes approximately 24 biscuits. This is the recipe exactly as Norma gave it to me. I have made a few small changes to suit me (and my pesky oven). I set my oven to 160 degrees celsius as it seems to always run hot and burn things - but play with your oven and see what results you get. Also, hubby prefers cookies that are a little more crunchy than chewy, so I actually bake them for 18 minutes. Generally I add a little more butter to the mixture - not much - but I usually use between 120 and 130 grams. Just depends on how accurate I care to be when I'm chopping up the butter. And lastly, a couple of times I've forgotten to add the salt, but I don't think it really matters as I usually only have salted butter in the house - all balances out. If you make them, let me know how you go, have fun! In stolen moments during the week, I was able to stitch the binding in place on Tilly's quilt. It's awfully cute, and I'm still in absolute love with the quilting pattern Lizzy used. This quilt was made entirely from fabrics I've had on hand for a little while. It almost feels like a free quilt when you don't have to head to the store for any of the elements of the quilt - and believe me, that doesn't happen too often for me! This time I got the one at the back on the right with the red crown. He's super glittery, love it! I'm getting quite a collection of them now ... but let's face it ... a girl can never have too many! I did manage to take a picture of the Moda Bake-Shop project I put together to help out my sweet friend Lizzy. She has quilted it for me, and I'm delighted with the result! Lizzy used a panto called Will o'the Wisp - isn't it pretty? Over the next week or so I'll get the binding ready and stitch it in place. I have a busy week coming, so I know time will be scarce. This quilt is destined for our cousin Lucy who has had a baby girl - she is named Tilly, isn't it a sweet name? And on the weekend I quickly put together a couple of the Spiderweb placemats as gifts for Camo's two teachers. I can't believe that after today there are only five days of school left for him this year? It has gone so fast!! I was so surprised to find that I don't really have a lot of Christmas fabric in my stash any more. I don't know what I've done with it. I either tossed it in a Feng-Shui attack or I've hidden it so well that I no longer have any clue where it is. The Spiderweb mats are fun to put together, if you feel like you could use a few leading up to Xmas, I put a little tutorial HERE, so get busy and make some - they're super fast. While I was quilting on the mats on Saturday, I had a moment of horror. My new Bernie disgraced herself in the most awful way. There was noise and a fracas in the bobbin region - accompanied by metal shavings and thread all over the place - no one likes that kind of quilting disturbance! Bernie II was quickly supplanted for her older relative Bernie I, and 9am Monday morning I was on Otto's doorstep with the offender in tow. Well, let me tell you that Otto is nothing less than a God, by 9.40 the same morning he texted me to let me know that Bernie II was ready to be collected. I don't know exactly what happened, but something got chewed up and spat out. Let's just hope my girl behaves herself for a good long time now. Thank you for the rescue Otto!! Are paper pieced hexagons still the flavour of the month? They are in my house, and they seem to be the only thing I'm interested in stitching on at the moment ... so I'm going with it! I know I'll find the next big love of my life project soon ... or perhaps it will find me, who knows! 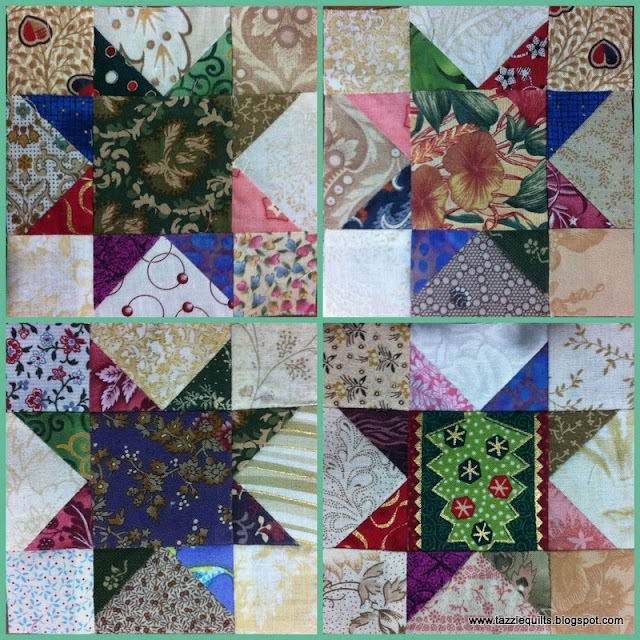 The green floral print in the centre of the block was not in my original plan, but when I saw it at Hettie's Patch, I knew it had to be part of this project, and I really love it. But I shouldn't really talk about a 'plan' as most of this project has just evolved - who knows where it will end up. I've been asked a few times about how big it's going to be ... and I guess it'll be as big as it is when I become tired of it. When I get a few more of the units together I'll share another picture. I've also been doing a whole lot of spring cleaning at home too. Latest on my list of things to tackle at home has been the laundry - it was terrible for a while there, and is looking a whole lot better. My laundry room is an odd shape, so Marty and I have been trying to come up with ways to use the space better - so far we're still scratching our heads. And I've also had something of an epiphany. My sewing room has become everyone's favourite dumping ground - it's looking really messy. 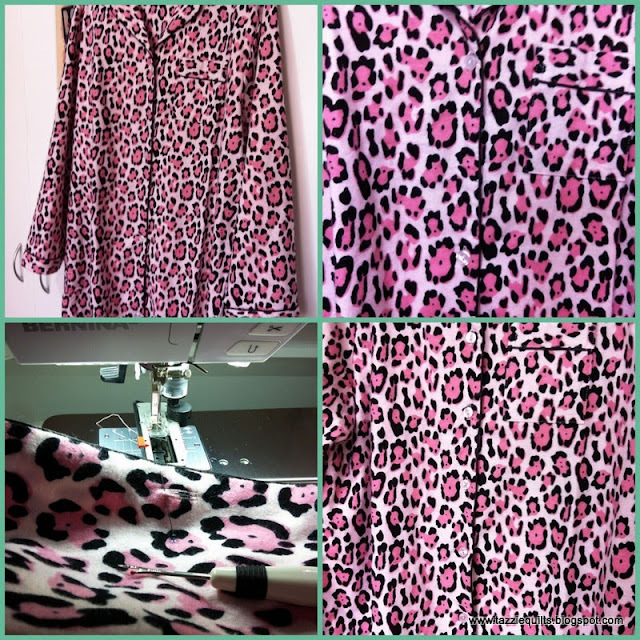 It's next on my list of rooms to tackle ... and I have been thinking ... it's entirely likely that my missing sewing mojo is directly related to the state of the sewing room. It's not nice to be in there when I feel edgy about all the stuff laying around. Perhaps I need to get busy cleaning in there sooner rather than later?? I'll let you know if there's any progress in that department. So you can imagine how thrilled I was to learn that I had placed first in my category (Open Traditional) and that I had also won the 'Retaining the Tradition' award. I am such a lucky girl, and I can't wait to put my new ribbons on the pin-board. Happy days!! And a hearty congratulations to all entrants and prize winners - this years show was of such a high standard. 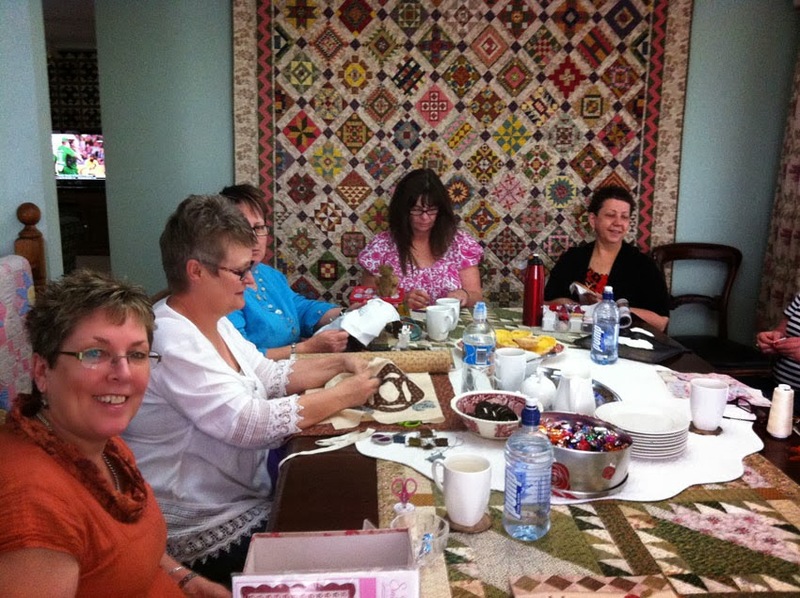 We have a lot of very talented quilters in our guild. 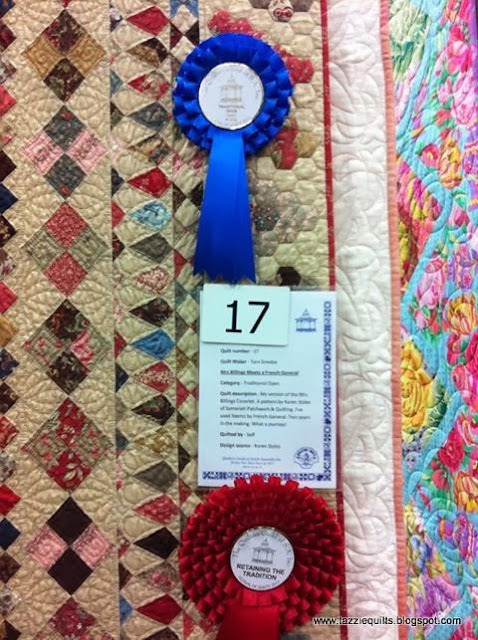 Be sure to check out our guild's webpage to see pictures of all the prize winning quilts. I've had it sitting around for quite a while, so it was nice to put it to use. You can see by it's messy state that I'd unrolled it and rolled it up again - never sure what I would make with it. The pattern Lizzy selected was from the Moda Bake Shop, and it's called the Cross Terrain Quilt. And just this morning I finally finished putting all the rows together for the Rail Fence Variation quilt top that Linda, Donna and I exchanged blocks for. I really like this top - it worked out a little larger than I realised, so I'm not sure at the moment if I'll add borders or not. Between the three of us, we don't even seem to have too many fabric repeats in the blocks which is a lovely surprise. When I decide on the borders, I think I'd like to hand quilt this one - but of course I'm prone to changing my mind. It's always such a dangerous place for me - all those things I didn't know I couldn't live without until I got there. I'm really looking forward to making dimensional gingerbread trees with those cutters - they'll look fabbo with the gingerbread house at Xmas time. Bring it on!! Hi there everyone, have you missed me? Actually, you don't have to answer that, I've had questions and emails from all over the place asking me when I'll be blogging again, and it's so nice that you've all cared so much. The truth is, along with my sewing mojo, my blogging mojo disappeared too. I don't think I've ever neglected my blog for so long. I learned how to make Anzac biscuits. My sweet friend Norma shared her recipe and assured me they're sooo easy. It wasn't hard to convince myself to bake some, they're my hubby's absolute favourites, and I've made four batches since getting the recipe. These are going in the regular rotation for sure! My sweet friends Vicki, Wendy, Gail and I went on a mini-break weekend down to Middleton. We stayed in Vicki's sister's house which was so lovely - this is the view from the front window. We did bring our quilty pleasures along, but didn't really stitch a thing. We were very much diverted by shopping, and spent a good deal of time gazing out the window, glass in hand. And why would we be gazing out the window? Because we were able to spend simply ages just gazing on the whales in the water right out front. Now, I'm no photographer, and there's only so much I can do with my iPhone, but let me assure you, we had spectacular views of many little groups of whales, and we were in the box seat. It was so special! And last of all, it's entirely possible that a little of my sewing mojo has returned. I've begun putting Camo's aviation themed quilt together. After Mrs Billings, working with such big pieces feels like working with bed-sheets. But at least I know it'll go together quickly - and Camo is really looking forward to this one. They're always fun to mess around with, and I love to reminisce over favourite fabrics. Soon it's going to be necessary to raid the scrap boxes for more bits and pieces - let's not have too much repetition. And when my mojo strikes with force, I've got the fabrics and pattern ready for Camo's aviation themed quilt. I'll share when I'm busy cutting. I've had so many friends send me pictures now, it's just wonderful A big thank you to my sweet friend Roz for taking these pictures. Isn't it just thrilling??!!?? I finally have a picture of my quilt with her ribbons!! My little brother and his family visited with my quilt and got a happy snap. Thank you Timmy! The pic is a bit grainy, but isn't it fun to see? :-) I know some of my other friends have been and taken some pictures too, but I don't have them yet - I'll share when I can. I plan to go to the show on Friday with Camo and I'll be able to get my own pictures then. His school has the day off for the show. It will probably be super chaotic, but totally worth it! I'm not sure if I remembered to share what I actually named my quilt ... its called: Mrs Billings meets a French General. Last night I got my act together and decided to try sewing something. I'm really winging it here, but I've started on a cover for my sewing machine. My machine comes with a cover of sorts - it's more for travelling. But because I have the machine lowered in the sewing cabinet all the time - and I don't ever close the cabinet - the cover is kind of too tall (and also not very pretty). I don't know if this little project will work out as I imagine it - I'm making it up as I go along, but it's looking quite pretty at the moment. My inspiration is here - a project by CJ Tinkle. I had pinned an entirely different cover by the same lady on Pinterest, but the pin leads me to a forum rather than her website, so I don't think there is a tutorial. However, you can click here to see my pin. So, it's safe to assume that if you don't see my sewing machine with her new cover in the next month or so, I probably haven't been happy with how the cover came out. I will persevere though, because I really want one! I must be half way! I guess I'm about half way through, and I've just finished my first reel of thread. I love this YLI thread for hand quilting ... it's just delightful. I'm hearing great things about the heavier weights of Aurifil too, so I think I'll try that for the next bit of hand work - the YLI will be a hard act to follow though. You all know I'm a glutton for punishment with huge time consuming projects, well, I've lined up my next one. It's a block-of-the-month project at Esther Alieu's blog. Do check it out. The first instalment will be issued tomorrow, and I'm really looking forward to it. This time, I'm not going to set myself a ridiculous deadline to complete the quilt, and I'll really enjoy working on it. Of course, I won't be able to get busy until I finish with Mrs Billings - and hopefully that will be within the next 8 weeks or so.